David Dunn (Bruce Willis) is a security guard who uses his superhero abilities when he moonlights as a vigilante. Kevin Wendell Crumb (James McAvoy) is a man with 24 distinct personalities who is kidnapping and murdering young women. After a confrontation, the pair are arrested and brought to a psychiatric facility for testing – alongside Dunn’s old nemesis Elijah Price (Samuel L. Jackson). With Glass, M. Night Shyamalan brings together and concludes the stories he introduced in Unbreakable and Split. In a bold move, he keeps the film grounded as close to reality as possible. He also relies very little on CGI, making what we see on-screen feel more real and unsettling. And much like the previous two films, Shyamalan uses various camera moves, pans and cuts to imitate the panels of a comic, and fills the frame with oddly specific colours – each one emphasizing something different. It makes for a fascinating experiment that toys with our expectations and inverts the baggage we bring after watching so many other superhero movies. That experiment becomes quickly problematic however, as Glass feels less like a film and more like a dissertation masquerading as Reddit fan-fiction. Unbreakable and Split are polar opposites tonally, and smashing them together feels completely inorganic and clunky. But Shyamalan is not concerned by this, as he is much more interested in the ideas these characters represent rather than the characters themselves. He succeeds in small doses, but so much of the Film feels overwritten, overwrought and pretentious. Worse, he misunderstands who his main audience has become in 2019. He’s no longer attracting the old stuffy critics he delighted in murdering in Lady in the Water. Instead, he’s attracting the millennials who made Unbreakable a cult classic and is forgetting that these same people (and many other audience members) already understand comic books, and do not need characters satirizing and making meta statements that border dangerously on Parody. 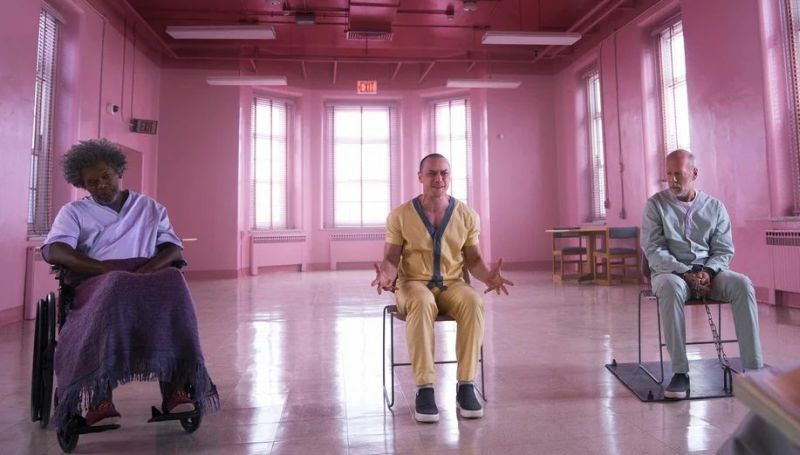 In a wise and inspired move, Shyamalan was able to bring back almost all of the main players from Unbreakable and Split. The Supporting Cast of Anya Taylor-Joy, Spencer Treat Clark and Charlayne Woodard are all enjoyable, but feel pigeonholed by the Film’s narrative confines. Willis brings strength and gravitas to his role, but spends too much time sleepwalking through a large chunk of his scenes. Jackson on the other hand, slips right back into Price’s skin with relative ease. No matter what ridiculous thing Shyamalan asks him to say, he’s having a blast doing it. Sarah Paulson does well for herself as well, shining and overshadowing nearly anyone who gets in her way. But much like Split, McAvoy is the true revelation, weaving in and out of distinctly different personalities with a level of meticulous perfection that goes unmatched by everyone. It feels like a disservice shoehorning him into this Movie because his performance is electric, masterful and so much better than the content around him. He takes what worked before, zeroes in on what made it great, and then makes it better. He even adds a few new characters into the mix, each one just as memorable as the last. Glass is a fascinatingly-flawed experiment that seems pre-destined to be a cult classic. Shyamalan swings for the fences, and manages to stick the landing more often than expected. His heady ideas and notions will intrigue many and frustrate even more. I only wish he could have explored them better, and allowed McAvoy’s brilliant performance to be part of the truly amazing film it deserves. Universal Pictures Canada release GLASS on Friday, January 18, 2019.